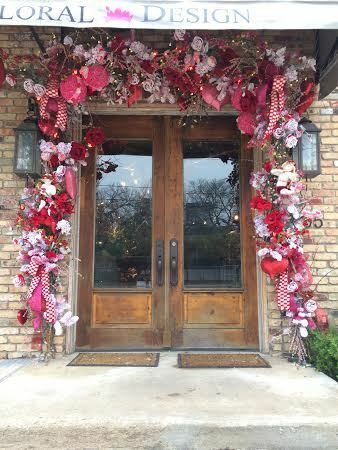 Add a little LOVE to your front door! 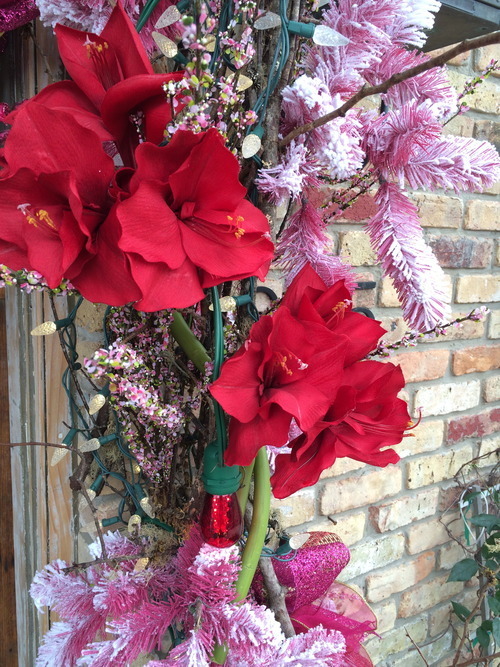 When transitioning from your Christmas décor to your Valentines décor why not make it easier on yourself? Take everything you have down, BUT leave your foundation and lights! Especially if the lights are white. Personally, we like to use LED lights, it gives a brighter look, uses less energy, and they last longer. Since it’s Valentines we decided to add some red lights to our project. 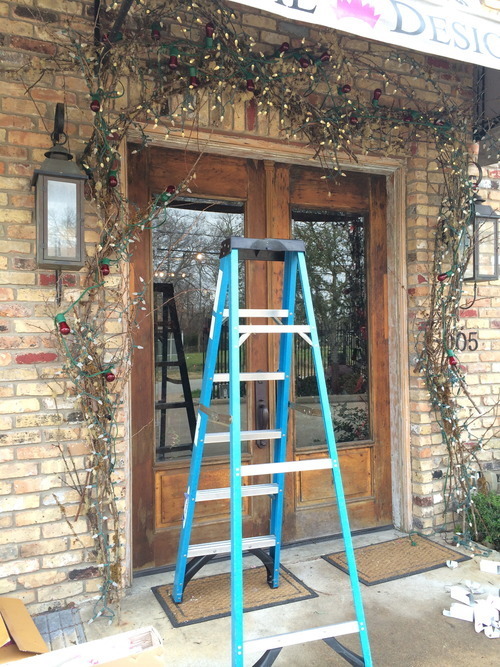 The bulbs we are using are on the larger side, so we’ll put them on before we attach all of our décor. 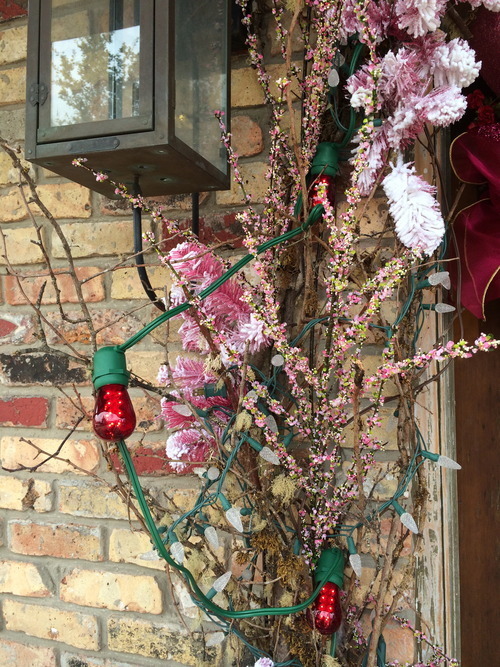 TIP: When attaching lights/décor we like to use floral wire. 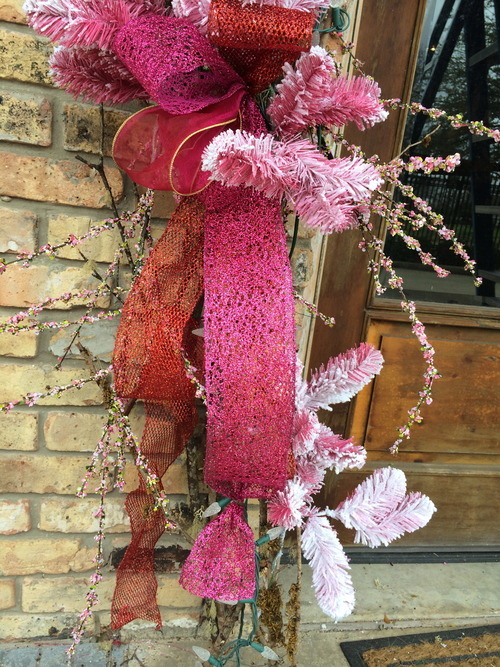 You can find floral wire at any floral shop, craft store, Michaels, Hobby Lobby, etc. 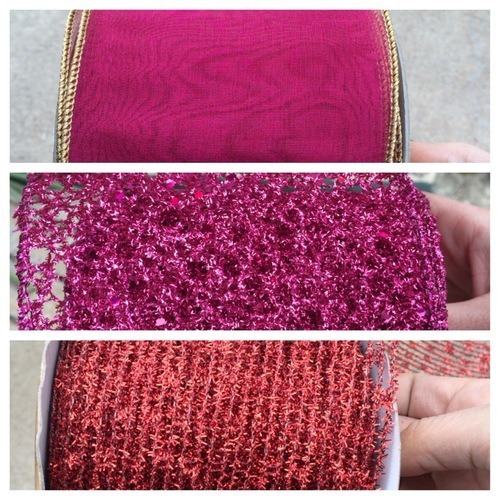 We find that floral wire holds better, plus, it’s easier to detach when you’re ready to takedown. TIP: When attaching lights with larger bulbs, add the cord first then attach the lights once the cord is firmly on base. It’s easier to maneuver the cord and prevents breaking the bulb. After our lights, we added some blooming branches and some pink-flocked garland (this will end up looking featherlike) to fill in some of the spaces and to add a thicker foundation. From here, we chose 3 different ribbons to make arrangements that we placed throughout our foundation. We needed a different texture to work with. You can make as many as you’d like. We tend to add two on the bottom (left and right) and two to the top (left and right). HOW: First, grab 3 ribbons of your liking. Second, with each ribbon make one loop by folding one end over, making about a 5-inch loop. Make sure your tail end is long enough to drape. Third, place all three ribbons together and tie a wire around to secure in place. Finally, place your arrangement wherever you choose. Use a wire to tie the arrangement to your foundation. 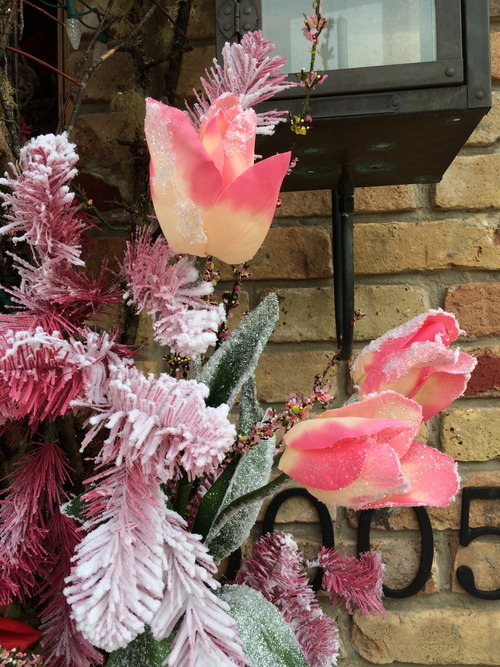 * Keep in mind that you can buy artificial flowers that are not frosted. 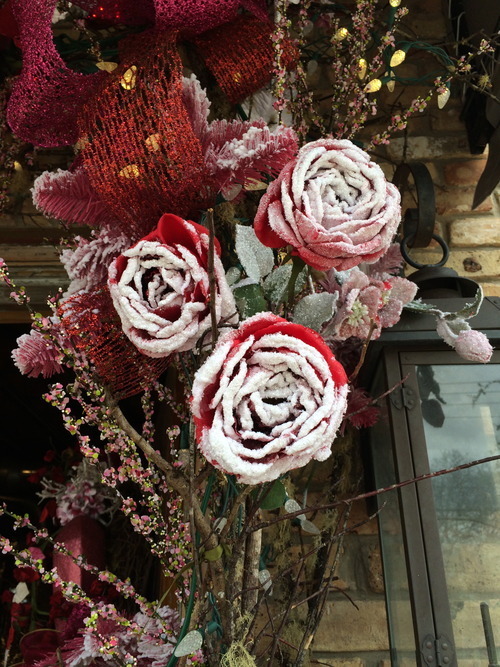 We chose frosted flowers because it adds dimension and interest to the mix. NOTE: We purposely left a few open spaces specifically for accessories. When adding accessories you don’t want it to cover parts that you’ve already done. From there, we added some eye-catching ribbon. 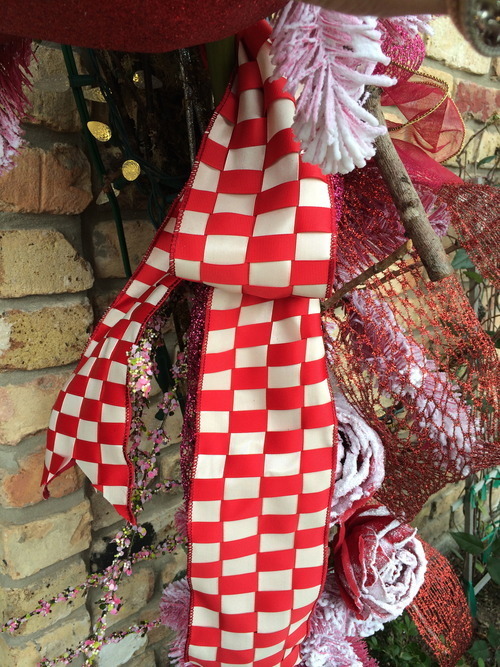 This isn’t always necessary, but we thought this red & white-checkered ribbon added some flavor. And last but certainly not least, it’s accessory time! 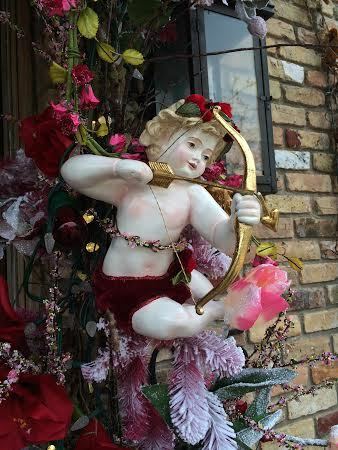 It isn’t Valentines without hearts and cherubs! 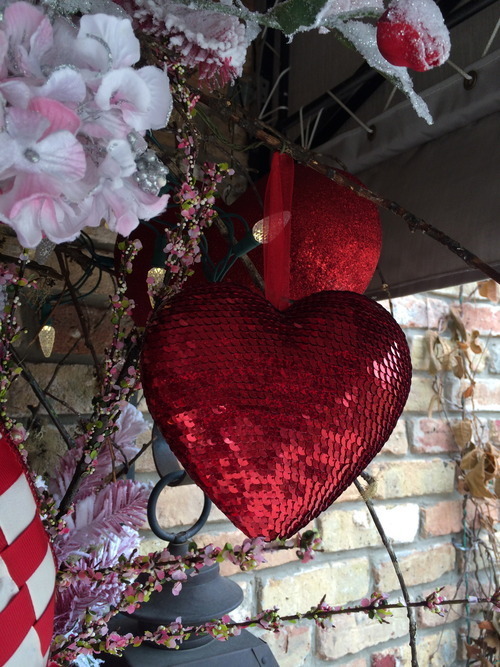 We added large pink and red plastic hearts, smaller red sequined hearts, and two adorable cherubs. We placed the two cherubs in the open spaces and then placed the hearts all over the piece. We tied a few into the base and let others hang off the branches. 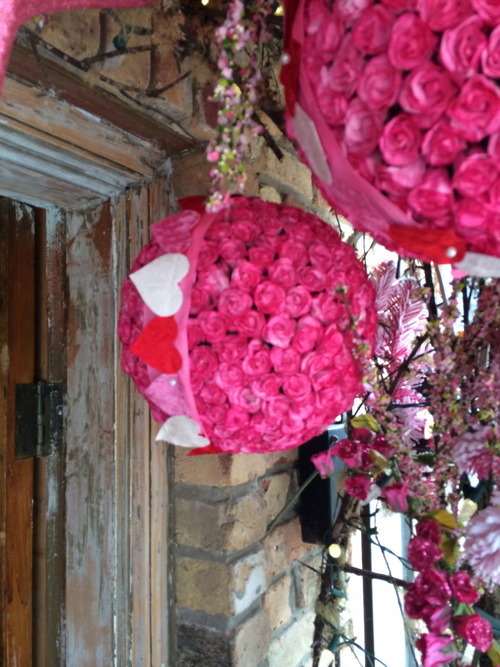 We also added a few pink rose balls to the top. We let them hang off a few branches as well. We thought that they looked a little plain hanging by themselves, so we decided to add some beautiful heart shaped ribbon around the ball to give it some flavor. And WAH LA we are DONE! For an instructional video go to our youtube page. 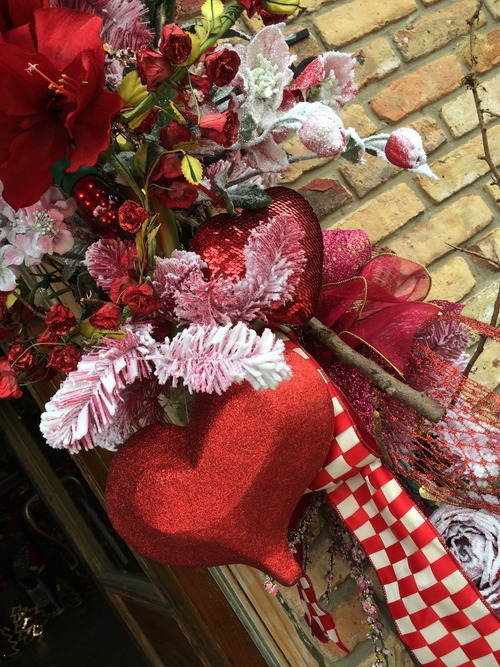 Check out this beautiful contemporary valentines arrangement!